Greenleaf Book Group Press, 9781626341463, 480pp. This stand-alone addition to the gripping Web series explores love and loss, career and family, forgiveness and redemption in. Fast-paced chapters propel unforgettable characters through the turmoil of overlapping and often conflicting commitments. Wedding bells are set to ring. April Toddman, the darling of the Jordon's retail dynasty, feels blessed. Her handsome, amiable fiance, Kyle Clark, is passionate and shares her dreams. No couple could ask for a more promising future. And yet, just days before they are to exchange their marriage vows, their perfect world begins to crumble. Fate steps in and puts April and Kyle to the test. Will they successfully thread their way through the conflicting webs to secure their happiness? With unfamiliar ground beneath their feet, April and Kyle must confront an unrelenting tsunami of obligations: to other--to their budding careers--and to themselves. Darlene Quinn, an international award-winning author and speaker, was a member of the management team for the Bullocks Wilshire specialty department store during a period of dynamic upheaval, which she vividly describes in her novels of suspense. Webs of Power and Twisted Webs both won the National Indie Excellence Award for General Fiction and were finalists in the USA National Best Book Award for General Fiction. Twisted Webs was also the winner of the 2011 International Book Awards for fiction and literature. 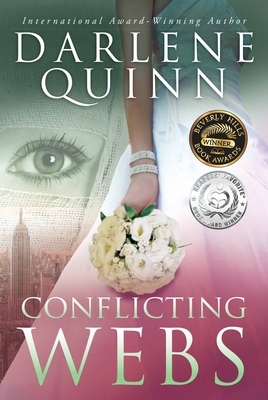 Webs of Fate was the 2011 winner of the Readers Favorite Award in the general fiction category.Darlene lives in Long Beach, California, with her husband, Jack.